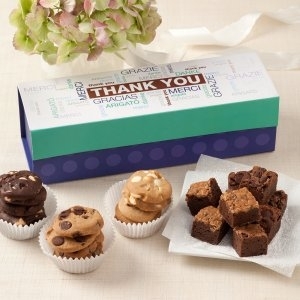 What better way to thank clients, business associates, co-workers, family and friends! In any language and at any time of the year, a delicious thank you is universally appreciated. Includes 18 Nibblers® bite-sized cookies and 12 Brownie Bites. Dimensions: 10.5" x 3.75" x 2.75"